When searching the internet or message boards for advice regarding club foot and treatments, you never seem to see much information past getting the brace. It's like all the materials just magically fast forward a couple of years. Even in Dr. Ponsetti's official stuff it is almost like those toddler years are just a side note. 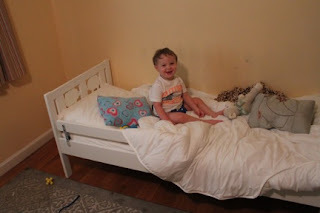 But since I am in the middle of this stage, I wanted to report on what it is like to have a very active toddler wearing a brace at night, and how our recent transition to a big boy bed went. I had been fielding questions from family and friends for a little while about when we would be moving our 20 month old son Jamie out of his crib. And to be honest, I wanted him to stay in the crib as long as possible, first and foremost, because it meant that he was still my baby. Once he moved into a real bed that was just one more reminder of how he was growing up too fast. 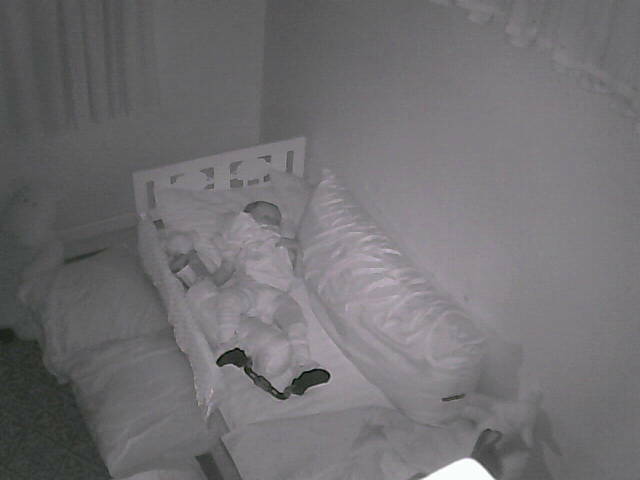 Selfish reasons aside, the other primary reason was I couldn't imagine how my energetic monkey of a child would do in a bed with hardware strapped to his feet. I was afraid that he would fall out and hurt himself, get tangled in the covers, or try to walk across the room and wake us up in a fit of screaming. Jamie was not concerned about any of this, however. He decided one day while my husband and I were on vacation that he didn't want to stay in the crib during his nap and climbed (and fell) out. Luckily my mother was watching him on our video monitor and managed to mostly catch him. This started a week of watching anxiously while he falls asleep, hoping that if he fell out that he would land on the pillows on the floor. Sometimes he did, sometimes we caught him, and sometimes we didn't. And that didn't stop him - so it was clear we had to move him into something lower to the ground, and fast! We found a youth bed at Ikea that Jamie hopped right into and said "night night!" It was several inches lower than the toddler bed our convertible crib could change into. 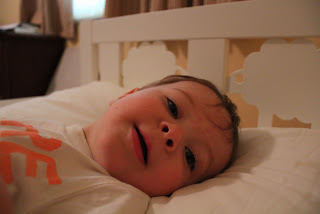 I put it together in an afternoon and we tried our first night in the bed with the Dobbs brace. We expected it to be a total disaster, but that first night had mixed success. 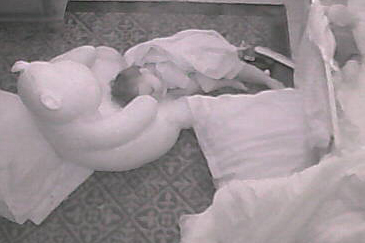 He fell asleep pretty well in the bed, but there were times that he fell asleep on the stuffed hippo on the floor. We also had to help adjust him several times as he tried to go around the room and in and out of the bed. After that, every night night got better and better. In less than a week he was sleeping his usual 11 - 12 hours a night and naps actually improved to 3 or 3 1/2 hours! My process for the transition was to keep his bedtime routine the same but move it to the bed. I made a big deal of unveiling his new bed along with a new Elmo book a couple of days before the move, "Big Enough For A Bed." We tell him to lay his head on his pillow after we finish our prayers and that big boys stay in their beds all night. 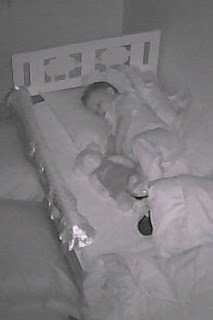 I still sometimes have to go in once or twice to put him or tell him to get back in his bed and go night night. After that, I have found that I am just reinforcing the behavior if I go into his room and he always eventually sleeps in his bed. I took out all the toys next to the bed and put them in the closet and the only books accessible are bedtime books. I made extra double sure that everything was as baby-proofed as possible in his room. 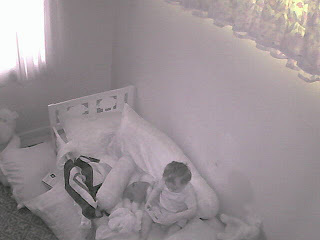 And of course, we have a video monitor so that we can see what he is doing. second night and already sleeping much better! Buy a cheap twin or youth size bed. I was horrified to see the damage on the inside of my lovely wood crib, and after just a week the side rail and foot board of the youth bed were quite nicked up. The in and out of the bed with the metal brace is very rough on the furniture and should be expected. The distance to fall is a concern when learning to sleep in a bed, so the bed should be a low to the ground as possible. It should be set up so one side is against a wall (if possible) and the other side have a side rail. I know some parents of very active children who put the mattress on the floor initially. They are more mobile than you may expect. 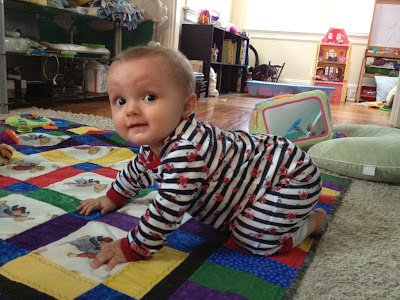 I had feared that he would have trouble moving around, but my son can almost walk in the brace, and has no trouble crawling around to get where he wants. I took away the big fluffy comforter for now and just put in lots of small pillows and a small quilt. Jamie was getting caught in the comforter but doesn't really need it yet anyway. The pillows help cushion him against the wall, and he loves them. He is able to get in and out without any assistance and the best part is, he knows to sleep in his bed. That conditioning from the crib is very strong. They may become more aware of the brace and how it is restricting movement. Jamie has told me several times in the last couple of weeks that his shoes are boo boo and tries to take them off. He does sometimes even fight me when I try to add the brace to the shoes. 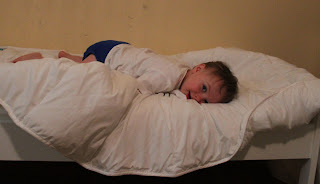 We have stuck with it, though, because I really felt like this initial time with the bed would be crucial in setting the expectations for night night as my toddler becomes a pre-schooler. We just had our every-3-month-appointment with Jamie's orthopedist and still have no update on how much longer he will be in the brace. He is correcting very well, thankfully, but we had hoped to have some idea of the timeline now that he has been braced for a year and a half. Listen to sleep signals and tire them out. 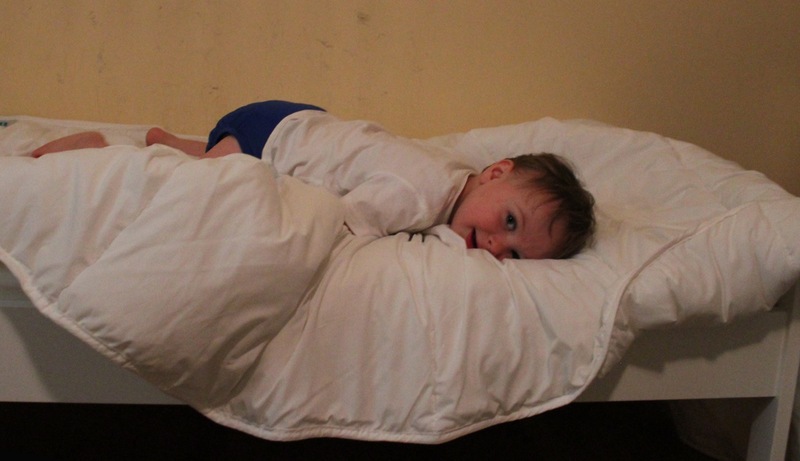 The freedom that a toddler bed offers is an understandable temptation. I have found that getting Jamie down for naps is usually much easier and he will sleep better if I listen to his tired signals. So when we are out doing errands and he is yawning, I have to force myself to head back rather than squeeze in one more stop. If he gets overtired because I was stretching him he takes much longer to fall asleep, and we have actually had to wake him to make sure he would be able to sleep at night. Doing energetic activities like going to the park in the morning also really helps tire him out so that he just wants to sleep, not stay up and play. We are starting potty training and he is doing GREAT! Trying to work this in with the brace has been interesting, so I will do another post with how that whole thing works through the perspective of raising a club foot child. This is a guest post from Victoria, who has been a bloggin' machine for Faith Feet & Love. She's previously written an Our Story feature as well as sharing some advice about the Importance of Humor when dealing with clubfoot. We want to thank Victoria for writing such an awesome guest post! If you'd like to write a guest post, please contact us for more details. When Eli first got his braces, we were told by Eli’s orthopedist (who we love) and by the people who made his braces, that he would adapt to them. We even heard stories about how some kids love their braces so much that they name them. While we’ve named the braces, usually with 4-letter names, I’m not sure Eli will ever grow to like his braces. You want me to wear WHAT to bed? This is one of the hardest parts of dealing with clubfoot. Because Eli hates wearing his Dobbs bar, which, by the way, is infinitely better than the Mitchell brace, everything becomes a fight. It’s a fight to put him to sleep. It’s a fight to feed him before bed. It’s a fight for him to get comfortable. It’s a fight to keep his braces on at night. And it’s a fight to simply keep him asleep once he’s asleep. And it’s only worse when he’s sick. Right now we are in approximately week 6 of ear infections. Which means that Eli is in such pain as he tries to sleep that he thrashes his little body trying to rip his legs out of the braces. It’s as if he can only deal with one problem at a time: his ears or his braces. Dealing with both is just overwhelming for him. It’s rough to watch as a parent. And it’s rough to enforce keeping his braces on his feet. Usually we like to use Faith Feet & Love to encourage and show people that there are solutions, and that there is a light at the end of the tunnel. But sometimes, the truth is, it’s just miserable. And that’s important too. Understanding just how hard it can be is an important part of surviving it. Of course we hope that your experiences with clubfoot braces is better than ours. From what we hear, Eli’s reaction is on the extreme side. This shouldn’t surprise anyone. Eli has his mother’s love of freedom, with a healthy dose of his father’s stubbornness. So you might be luckier than we are. In the meantime, we expect Eli to start naming his ear aches before he names his braces. In the Bible, Eli was a priest. He was in charge of all the priests of Israel and had a special place in teaching people how to worship God. Eli started as an amazing priest, doing amazing things. Someone who cared greatly for the things of the Lord (such as the temple and ark.) But over time, he lost his way. So much in fact, that his protege’s first message from God was one of punishment. (Samuel was told to let Eli know his time was over, and Eli’s sons would be punished). God then chose to allow Saul to become King. Saul was a humble (Samuel 9:21) and brave man (Samuel 14: 46-48). But he didn’t finish strong either. He became jealous, petty, and bitter. This thrust David, soon to be Israel’s greatest king into the throne. And as you might imagine David started strong, but lost his way. David ended up committing murder to cover an affair. Which I’m pretty sure are bad things. All 4 men were likely more accomplished, more spiritual, braver, stronger, better than you or I. In every way imaginable, they were men filled with amazing potential. Yet they couldn’t finish strong for the Kingdom. They all allowed life to get in the way of their faith. There are days when Heather and I look at our lives and wonder how we’re going to get through the week. We feel overwhelmed by doctor’s visits, sleepless nights, complications from clubfoot, and all the normal problems that come from raising a kid. It’s hard to finish feeling like that. On a nearly daily basis we have to circle back and remind ourselves of what’s important. Remind ourselves that we have to stay focused on the realization that that our suffering (and Eli’s) isn’t permanent. That things will get better. And if they don’t, then God is still with us, and he’s still working powerfully in our lives. I’m not saying it’s an easy thing to do. Or that we’re particularly good at it. But it’s something that we are both beginning to see. As I look at our own Eli, I wonder if he’ll finish strong. Will I be able to teach him to finish strong as his Dad? Those are questions we don’t have any answers to. They’re also the questions that keep me up at night more than any other. But I am hopeful. Hopeful because God doesn’t forget us, even if it feels like it. But also hopeful because one of the things we’ve seen from Eli’s clubfoot that is a good thing is his determination. He never seems to have an easy path. Even getting over a typical ear infection takes multiple trips to the doctors, multiple types of antibiotics and shots. Crawling was no different. But through it all, Eli keeps working hard. Will this last when he’s 15? 45? 90? But there is hope. God never forgot Israel, even through the mistakes of Eli, Samuel, and Saul. And in the end David managed to pull it together. After making terrible, terrible choices, he repented and finished strong. There is always hope, but the hope isn’t in our own abilities, it’s in what God has to do. Two things I am shamefully good at. Worrying & being too prideful to admit when I need help. I am super Mom after all. I must never fail. The truth is I fail each time I worry. I fail each time I am too proud to ask for help. While I am spending time worrying, being burnt out and overwhelmed, my kids and husband are only getting part of me. I am not really ever fully present when I am consumed by thoughts of doubt, fear, and what if’s. When I took Eli to his 6 month appointment in May it was determined that Eli was severely developmentally delayed. I. Was. Horrified. I felt as though I had once again, completely failed as a mother. It wasn’t bad enough that my son had bilateral clubfoot and has kidney disease; he also has to be developmentally delayed?! Our wonderful pediatrician, Dr. Manfroy, as you may remember, ordered a MRI to see what was going on with Eli’s brain. And then he prescribed a good dose of humility and suggested that we get help from Help Me Grow. Working as a Special Needs Coordinator for our local Career Tech school I knew about Help Me Grow. My prideful self also never thought we would be the type of family that would need services from Help Me Grow. I am super Mom after all right?! After talking it over with a few of Eli’s doctors and nurses (I can’t seem just trust one specialist… Why? Because I have officially taken up residence in Crazy Town thanks to all my worrying hahaha) Eric and I determined this would be the best thing to get Eli the help he needs and to get him on track with his peers. Our first meeting with Help Me Grow was an eye opener. I think I had lived the last 6 months in a state of denial. Or maybe I just didn’t realize how delayed he was until he was evaluated. That led to a whole other set of worries, which then lead to more stress at home, more tears, and a pretty crappy summer. All for what?! Worrying wasn’t fixing my baby. It was making me CRAZY! This brings me to last night. Eric and I were at training at our church, Crossroads, last night. While we were there we were working through an exercise that allowed us to share a bit of our story of Eli with others at the table. As we were praying as a group, Aaron, a man from Atlanta spoke up and said that he really felt like God was telling him to pray over us. His prayer was really amazing. I felt it through my entire body. Afterwards, the groups dismissed and the man who prayed for us said that while he was praying he felt God telling him that God entrusted us with Eli. He also said God told him that Eli is special, not to be seen as a burden, but as a gift. God has spoken these words through other people on many other occasions. This is the first time I think it has actually resonated with me. I haven’t been able to get his words out of my head. There’s just something about hearing those words from a stranger; someone who hasn’t been down this long road with us. A person we just met moments before. Maybe Eli really has been set apart. Maybe there is something special about my baby above and beyond what we as his parents already know. That’s the funny thing about God. He just keeps showing up until we get it. I think God sent Aaron last night to our table so I would finally “get it”. As many of you know, I've never been much of a patient person... and when I am excited... Watch out! Hahaha! I think it's safe to say, that I am the most proud Momma in the world tonight. I know some might find me crazy for being so excited over something so basic, but after watching Eli struggle the last ten months to meet milestones and fight through the pain of physical therapy, I can help but have my chest swell with pride over my little mans huge accomplishment! Right. On. Target! Happy 10 month's munchkin man! You are a true rock star and teach me everyday to never underestimate the power of prayer and just how much of a freaking fighter you really are! This weekend, for the first time since Eli was born, I was able to get up in the morning and make breakfast for the family! Woohoo!! Once breakfast was on the table, I looked at Eric and said, "gosh it feels so good to be getting back to the good 'ol days!" Getting breakfast on the table was a huge sign for both of us to how far we have come. The last 15 months have been grueling. Some days it felt as though we were merely surviving the day. Living for rest. Trying to man up through the heart ache just so we could try and get through yet another day. Praying the next day would be easier than the last. Even poor Isabel was feeling the grind. It's been hard on everyone. While we were walking into Kings Island, Isabel said to us, "having a little brother is hard... having a little brother with disabilities makes it much harder." I realized then just how hard the last 10 months have been on her. Even with as much as Isabel loves her brother. While we have been managing all of Eli's doctors appointments, trips to Children's Hospital, physical therapy appointments, Help Me Grow visits, & just trying to figure out how to be parents to a kid with a disability, Isabel has inadvertently taken the back seat for the last 10 months. A day alone with Mom and Dad, riding roller coasters, was just what Isabel needed! This is the look of a girl who is happy to be getting some undivided attention! My baby is almost getting to big to carry! When did she grow up?! After an awesome ride on the Racer! We managed to get a smile out of her! She made it! And LOVED it!